We all know how important it is to protect one of the most precious and largest organs in our body...our skin. Now that the sun is finally shining and summer is around the corner, it's a good time to break out the sunscreen. Living in Los Angeles for nearly three years now, I started wearing sunscreen every day just to walk around and do errands. I've tried just about every sun protection product out there so to help you navigate the different options, check out my top 10 list of face and body sunscreens. Whether you like cream, spray, gel or tinted, I've got you covered. Always remember to apply your sunscreen 30 minutes before you go outside for the best skin protection! Mineral Light Hydrating Sunscreen Lotion SPF 50+ is a new, lightweight, chemical-free sunscreen for the face and body that provides maximum broad-spectrum sun protection without irritation. Mineral particles are enhanced with powerful antioxidant protection from Vitamin E to protect against damaging sun-induced free radicals. The sheer, non-whitening lotion provides hydration and maximum water resistance and is perfect for sensitive skin. It layers well under make-up too! 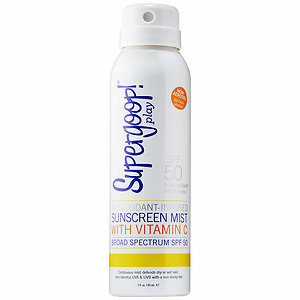 La Roche-Posay makes some of the best sunscreens available in many formulas. This one in particular, is a cooling gel-like lotion that refreshes the skin while offering broad spectrum UVA/UVB protection with antioxidants and long lasting protection. The powerful antioxidant complex includes Senna Alata, a tropical leaf extract known to defend skin cells from environmental aggressors to help prevent premature aging. The weightless sunscreen is fragrance-free so perfect for sensitive and acne-prone skin. It's also the first formula with UVA/UVB protection texture that transforms like water on the skin, while providing an immediate cooling effect. This innovative formula for the face is multifunctional and truly a miracle worker--it provides translucent SPF 30 protection, is an anti aging treatment and make-up primer as well. I was blown away at the results after trying it as part of my research for this article. Murad Invisiblur Protecting Shield contains mushroom peptides that diminish the look of fine lines and wrinkles by helping aid natural regulation of collagen and elastin. I found it to be one of the best products to smooth and blur skin imperfections. This special product greatly improves skin tone and it's texture. In a Murad sponsored study, 71% saw fewer lines and wrinkles, 94% saw improved smoothness and texture, 100% invisible SPF protection. Honor MD Protect provides superior sun protection for the face against the free radicals caused by both UVA and UVB rays. In addition to its antioxidant properties, it also contains octapeptide technology which is shown to reduce wrinkle formation (yeah!). Feels great on the face and under make-up. HydroPeptide Solar Defense is a lightweight, hydrating and anti-aging face day cream with advanced sun defense. This formula blocks 97% of UV rays that cause sunburn and premature aging. A soft smart-tint automatically adjusts to your skin tone for flawless coverage while antioxidant-rich acai extract neutralizes free radicals. It also hydrates the skin and contains Niacin to calm redness and galangal root to reduce excess oil production. Suntegrity is a natural, healthy and holistic sun care line founded by Tricia Trimble after losing her mother to melanoma. Driven by the idea that a skin cancer prevention product should not contain other cancer causing chemicals, she worked with a highly skilled team of industry specialists to create Suntegrity Skincare in honor of her Mom. The zinc-based, moisturizing face and body sunscreens are infused with youth promoting antioxidants and are free of parabens, phthalates, propylene glycol, mineral oils, synthetic dyes, sulfates, titanium dioxide and chemical UV absorbers. True to its name, the 5-in-1 face sunscreen is a bronzer, moisturizer, bb cream, and primer all in one. It's good for all skin types and available in several shades. I fell in love with this product because of its high-quality formula and it saves me time getting ready in the morning! Glotherapeutics makes a perfect tinted, lightweight, oil-free sunscreen that provides moisture to combat dehydration and dryness. It contains broad spectrum UVA/UVB protection to guard against the sun's rays and the sheer hint of color softly evens out your skin tone. Available in several shades. NEUTROGENA® CoolDry Sport Sunscreen lotion features a special Micromesh™ Technology that stays in place, even during rigorous exercise! The new formula provides breathable sun protection so sweat can evaporate off of skin without compromising the SPF. This sunscreen feels good on the skin and is pleasantly scented--it's the best drug store sunscreen for outdoor fitness enthusiasts. With Neutrogena brand ambassador Julie Bowen at the Neutrogena #PushFurther event where bloggers and press were able to sample the product. It's so convenient to use spray sunscreens on yourself and the kids, especially when in and out of the water. This one by Supergoop! is aerosol- and oxybenzone-free with complete broad-spectrum AVA/AVB protection. The hydrating, antioxidant-rich formula contains vitamin C, and can be applied to wet or dry skin. Plus, the light citrus scent smells nice and the price is right! We tend to forget about our lips but they are extremely sensitive to the suns rays and can easily burn and blister from too much exposure. A great way to protect them from harmful UVA/UVB rays and the drying effects of sun, wind and sea is with Sun Bum sunscreen lip balm. It contains vitamin E, aloe and cocoa butter and soothes even the driest of lips—available in a variety of tropical scents!